Seen from the 30th floor of the Hilton Alexandria Mark, the prominent monuments of Washington, D.C. rest squarely atop the horizon. 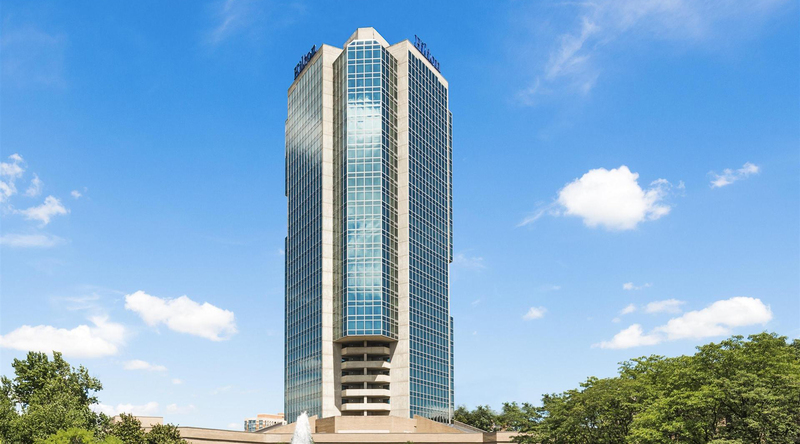 In August, the 30 floors of the Hilton Alexandria Mark will be overflowing with energy and enthusiasm as hundreds of AEPi Brothers and guests convene for the 106th International Convention. Without question, International Convention is the central point around which all else in the AEPi-universe orbits. Nowhere else can one engage with the breadth and depth of the fraternity network. Nowhere else can one experience the collective footprint of the fraternity on world jewry. And nowhere else can one envision the future leaders of the Jewish people in their most formative years at the most formative event. The celebration of AEPi’s first 106 years promises to deliver an improved convention experience defined by the fraternity’s founding ideal of Jewish Brotherhood and recent actualization as the preeminent leadership organization in the Jewish world. Attendees can expect to see tremendous advancements in fraternity programming, namely leadership training programs reimagined from the ground up to leverage fraternity experience into life skills and individual fulfillment, career-focused education and exposure with the most diverse and successful pool of industry leaders at any one fraternity event to date, and wide-scale recognition of individual and chapter achievement materializing in the grandest spectacle of AEPi exuberance since the Centennial. Located just five miles south of the DC-Virginia state line, the Hilton Mark borders an extensive botanical preserve complete with hiking trails and waterfalls, making it well situated for both the urban explorer and the nature-seeker. From the hotel, Brothers can traverse the intravenous network of highways, railways and waterways spread across the sprawling suburban landscape that connect the tissue of metropolitan DC to see all that The District has to offer. Just across the city border lies the National Mall, home to the iconic monuments of DC – Lincoln, Washington, Jefferson – flanked on all sides by the nation’s most diverse range of museums and its instruments of governance – the White House, US Capital, Supreme Court. Follow the Potomac River down and find yourself at one of DC’s premier waterfronts – The Wharf, Old Town Alexandria, The National Harbor – or ride the metro to the city’s nightlife hubs – Adams Morgan or U Street. This summer, celebrate your Brotherhood, celebrate 106 years of Jewish leadership, and celebrate the future success of the fraternity at AEPi International Convention.